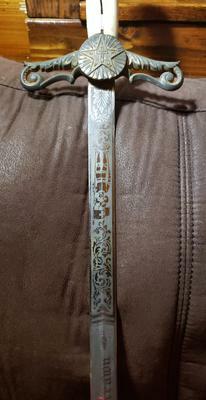 I found a sword going through some of my in laws belongings. 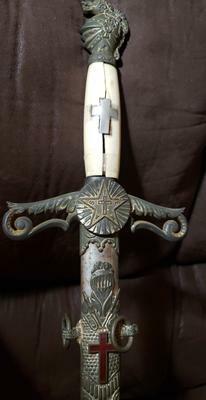 It is a Masonic Knights Templa Sword with the Texas Crest. My understanding is this sword is rare, as Texas was the only state (during that time at least) that required the state symbol on their swords. It has an Ivory handle with an inlay of a silver er cross. 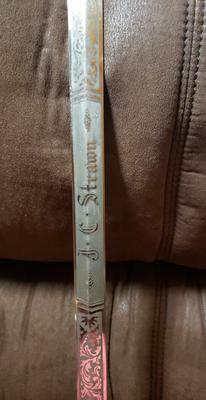 The blade is beyond gorgeous and has the name " J C Strawn" on it. I am trying to find out how to locate the family of this person. Also, it was made by The Henderson & Ames Co. After researching this, I was able to learn that this particular sword was made between the times of 1893 and 1923, which makes this sword between 96 and 126 years old! I am beyond ecstatic about this. I will keep this in my home as a part of history if I cannot find the family of the owner. Unfortunately only his initials and last name is all I have. I have found NOTHING online with his name. Can someone point me in a right direction? They might be able to give you some information on JC Strawn and, possibly, put you in touch with any current members of that name. If that doesn’t work, you could always try the Grand Lodge of Texas at 715 Columbus Ave, Waco, TX 76701, phone (254)753-7395. All Knights Templar are Masons, so if JC Strawn was a Knight Templar in Texas, they would probably have some info on him.